The commemorative USSR stamps, between 1926 and 1928, publicize Esperanto Movement and celebrate important historical events. 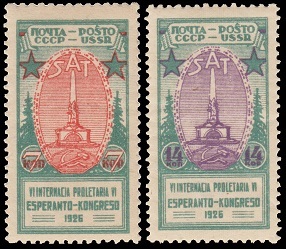 The two commemorative USSR stamps shown above were issued on August 5, 1926 to publicize the Sixth International Esperanto Congress, held in Leningrad. The stamps are lithographed and perforated 12 x 12 1/2. The common design features the Liberty Monument in Moscow, sculpted by Nikolay Andreyev (1873-1932) to commemorate the Soviet Constitution. The monument was destroyed in 1941. 07 K. (1926 - Sc. #347) - Blue Green & Red. 14 K. (1926 - Sc. #348) - Blue Green & Violet. The 14 K. denomination commemorative stamp shown above was issued in July 1927 to celebrate the 40th Anniversary of the Creation of Esperanto. The stamp is photogravure and perforated 10 1/2. The design features a portrait of Dr. L. L. Zamenhof. The text on the stamp is written in both Russian and Esperanto. 14 K. (1927 - Sc. #373) - Yellow Green & Brown. 14 K. (1927 - Sc. #374) - Yellow Green & Brown. Ludwik Lejzer Zamenhof (1859-1917) was a Polish ophthalmologist, inventor, and writer, and he is the creator of Esperanto, the most successful constructed language in the World. Zamenhof envisioned a world without war, and he believed that this could be accomplished by a new auxiliary language. The vocabulary is based on the Germanic and Romance languages, and the grammar is based on the Slavic languages. Esperanto is still spoken by many people around the World. 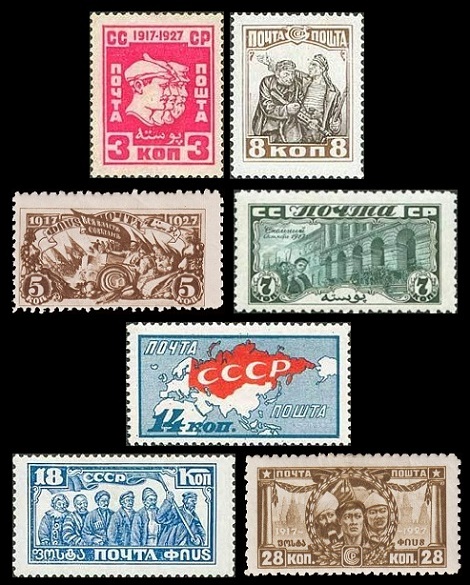 The seven commemorative USSR stamps shown above were issued in October 1, 1927 to celebrate the 10th Anniversary of the October Revolution. The stamps are unwatermarked and come in a variety of perforation measurements. 03 K. - Worker, Peasant, and Soldier. 05 K. - Lenin riding in a car, guarded by soldiers. 07 K. - Smolny Institute in Leningrad. 08 K. - Worker and Sailor. 14 K. - Map of the USSR. 18 K. - Men of various Soviet Republics. 28 K. - Workers of different races. The Kremlin in the background. 03 K. (1927 - Sc. #375) - Bright Rose. 05 K. (1927 - Sc. #376) - Deep Brown. 07 K. (1927 - Sc. #377) - Myrtle Green. 08 K. (1927 - Sc. #378) - Brown & Black. 14 K. (1927 - Sc. #379) - Dull Blue & Red. 18 K. (1927 - Sc. #380) - Blue. 28 K. (1927 - Sc. #381) - Olive Brown. 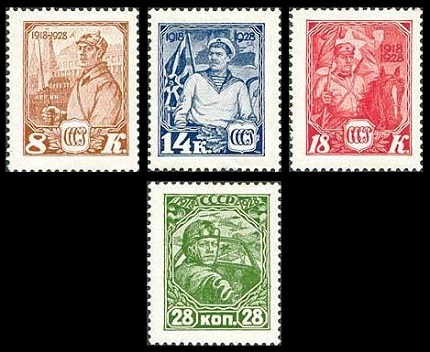 The four commemorative USSR stamps shown above were issued on February 6, 1928 to celebrate the 10th Anniversary of the Soviet Armed Forces. 08 K. - Soldier and Kremlin. 14 K. - Sailor and Flag. 08 K. (1928 - Sc. #402) - Light Brown. 14 K. (1928 - Sc. #403) - Deep Blue. 18 K. (1928 - Sc. #404) - Carmine Rose. 28 K. (1928 - Sc. #405) - Yellow Green.